My sisters are coming to visit. They arrive tonight and I am over the moon excited. 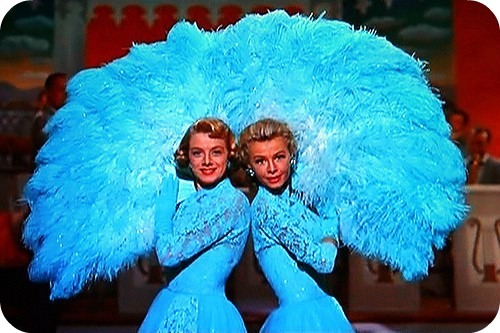 I've been humming Sisters from White Christmas for days. I hope to one day talk them into reenacting it with me for a family talent show. That would be pretty classic. Anyhow, I am looking forward to a weekend filled with slumber party goodness with my two beautiful sisters. p.s. Do you have sisters? I think all sisters have their "moments". How funny....that's the song that plays when my Sister calls me. :) One of my favorites! I adore my sister. I talked to her on the phone today and it was just the thing I needed. I was so so happy to get to meet your sisters today. I hope your whole visit with them is wonderful! I have a little sister, she's the biggest pain in my life but I do adore her and she has me wrapped around her little finger (which is frustrating at times, haha) She's getting married next year and I can't wait already. My uncle used to sing that to us all the time and I only just realised last year that it was from White Christmas, crazy huh. Dan's 4 younger sisters sang that song at the other sister's wedding a few years ago - it was precious! You know I don't have a sister - sometimes I wish that I did. I consider my close girlfriends like you to be my adoptive sisters though. I hope you have a wonderful time with B and A. They are so lucky to have you as their sister! I have a half sister who is about 15 years older than me. I didn't meet her until I was 8 or so. Then I didn't really see her again for years. The last time I saw her was at our Dad's funeral in 1997. Thanks to facebook we connected. She has been showering us with gifts and love in preparation for Baby Woo! She's made a quilt and wall hanging and owl clock! She's given us prints for the walls and even found my dream fabric for the dust ruffle for the crib so that I could make the perfect thing for my little girl. It has been magical! I have 4 sisters - 3 younger and 1 older. I love them all but my oldest sister is definitly my best friend in the entire world. I go to her for anything and everything. MY dearest wish right now is that her husband will get a job in Atlanta. THen her dream of having a home will come true (courtesy of a really fabulous buyer;s market in Atlanta) - and we will get to be close in body as well as spirit.